Coastal resource managers shut down shellfish beds in three New England states in mid-May—including rare closures of Massachusetts Bay and Cape Cod Bay—because of an intense bloom of the toxic algae Alexandrium fundyense. Researchers from the Woods Hole Oceanographic Institution saw the “red tide” coming before its toxic effects reached the shore. 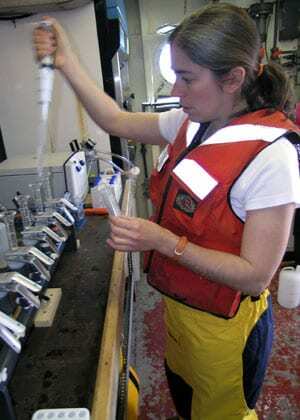 The bloom of Alexandrium—the worst since 1972—began just as biologists and oceanographers departed Woods Hole on May 9 on R/V Oceanus for a long-planned research expedition to study the harmful algae. 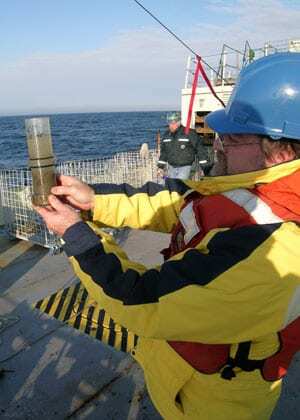 Within hours of reaching open waters east of Boston and Cape Ann, the team led by physical oceanographer Dennis McGillicuddy and marine biologists Deana Erdner and Bruce Keafer found hundreds to thousands of algal cells in every liter of water sampled from the ocean. McGillicuddy and Keafer traded daily cell phone and e-mail messages with their counterparts on land, including WHOI Senior Scientist Don Anderson and colleagues from several fishery and water resource agencies in Massachusetts, New Hampshire, and Maine. Though some shellfish beds in Maine and New Hampshire were closed just before the cruise, managers in Massachusetts had not yet detected toxic algae within the Bay. It was just a matter of time. On an expedition that took them from edge of Boston Harbor to the middle of the Bay of Fundy, the WHOI researchers worked around the clock for eight days. 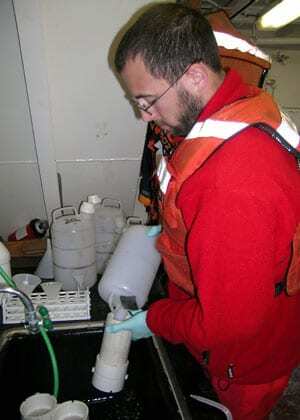 They collected nearly 500 water samples from 160 locations in the Gulf of Maine as they surveyed and mapped the location of Alexandrium cells. 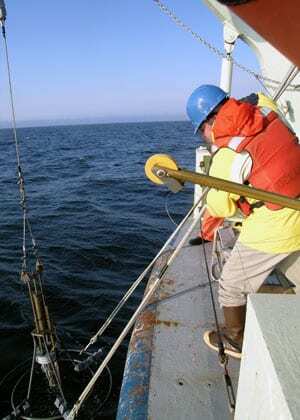 Using novel genetic probe techniques developed at WHOI and the Monterey Bay Aquarium Research Institute, the shipboard scientists were able to rapidly detect and quantify the amount of harmful algae in offshore waters. 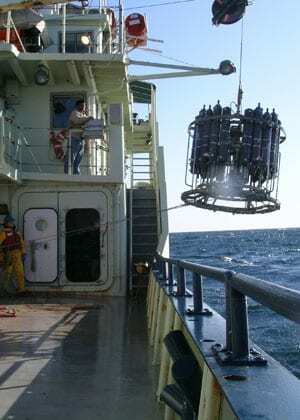 At the same time, researchers on the ship and at Dartmouth College provided oceanographic models of where ocean currents were likely to carry the cells. 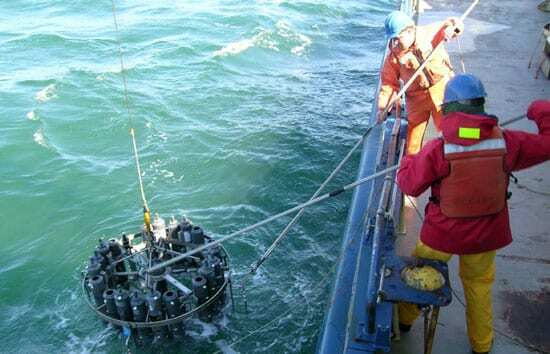 The researchers detected a mother lode of Alexandrium on the western edge of the Gulf of Maine and in Massachusetts Bay. The algae are notorious for producing a toxin that accumulates in clams, mussels, and other shellfish and can cause paralytic shellfish poisoning (PSP) in humans who consume them. Alexandrium is naturally distributed throughout New England waters, though it typically develops into large-scale blooms only in waters off Maine and Canada, with intensities varying from year to year. The research expedition was the first ever for the Woods Hole Center for Oceans and Human Health, a new center funded by the National Science Foundation and the National Institute of Environmental Health Sciences. 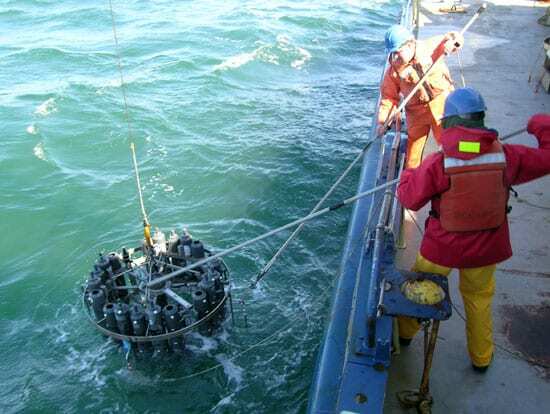 (See “Risks and Remedies from the Sea.”) The purpose of the research cruise was to analyze and model how physical, chemical, and biological factors combine to distribute and disperse Alexandrium throughout New England waters. Researchers also hoped to discern how those factors can naturally select for certain strains of the organism—which vary widely in their toxicity—to favor blooms at different times. In most years, natural current and wind patterns keep the cells from flowing into the coastal waters of southern New England. But during a spring marked by unusual amounts of rain and snowmelt and steady stream of northerly and easterly winds—capped by nor’easters on May 7-8 and May 24—ocean conditions developed almost perfectly for a massive bloom. Anderson and McGillicuddy offered several possible explanations for the widespread algae bloom. 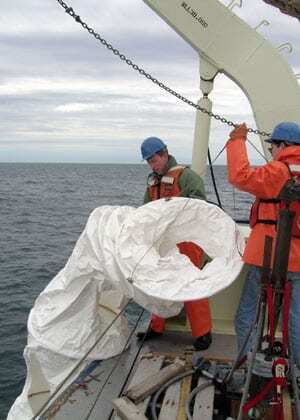 The first is that the unusual weather patterns this spring—particularly the wind-driven currents from the north—pushed an abundance of Alexandrium cells south into Massachusetts Bay and Cape Cod Bay. Another idea is that there was a larger source of cells in the Gulf of Maine, following an intense bloom off western Maine in autumn 2004. Or perhaps the record-setting precipitation of this winter and spring flushed more fresh water and nutrients into the coastal region, creating better conditions for the cells to grow and reproduce. 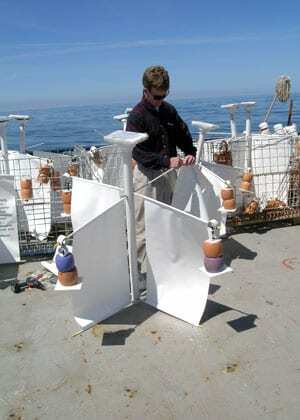 Finally, ocean conditions this year may have favored a particular strain, or genotype, of Alexandrium in the western Gulf of Maine. In response to the large-scale bloom, WHOI researchers have been granted “rapid response” funds from the Center for Sponsored Coastal Ocean Research at the National Ocean Service to follow up and extend their studies of this bloom for several more weeks. Using WHOI’s coastal research vessel Tioga, McGillicuddy and Keafer will conduct at least two more surveys of Massachusetts Bay and Cape Cod Bay in June. In the coming months, marine biologists will examine the genetic makeup of the cells they collected to decipher the diversity of the Alexandrium population. Chemists will analyze dissolved nutrients in water samples to find the natural blends that promote or hamper the algae’s growth. Physical oceanographers at WHOI, Dartmouth, and the Northeast Fisheries Science Center will refine their models of how ocean currents and North Atlantic weather patterns affect the distribution and intensity of Alexandrium blooms. 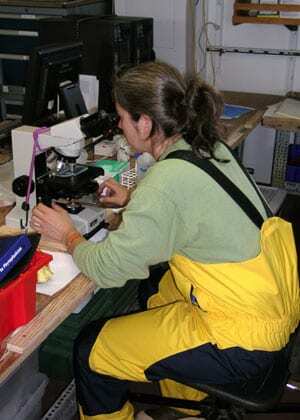 Together they will sort out the confluence of factors that produce harmful algal blooms in New England waters.